Is it possible to add Gaussian blur or any effect to a painted layer mask? I have two curve layer adjustments for my dodge and burning retouch work on AP for my iPad Pro. I’d like to select a section of the mask and add a Gaussian blur. Is this possible? If so, how do I do this? I new to AP but a Photoshop veteran looking for an iPad alternative. Start with pixel image. Add a curve adjustment (or two). Change to selection mode and on main layer make selection. 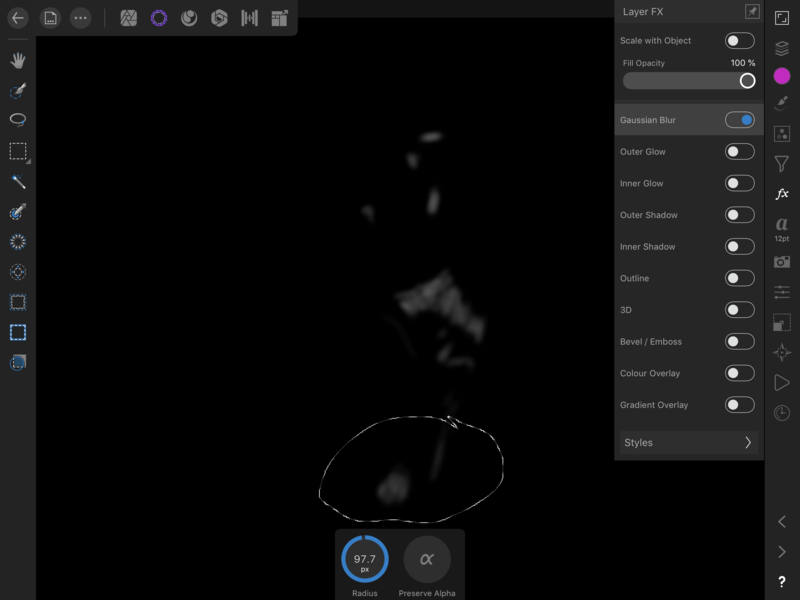 add Gaussian blur to selection. Perhaps, I am understanding this wrong. I have attached a screenshot for reference. I want to add the blur to the layer mask I’ve painted over, but only a portion of the painted selection. Take a look at the attached. You need to apply the selection to the main photo (the one you applied the curves to) then use the filter studio and Select Gaussian blur filter. The effect of the blur will be limited to the selected area. The curves will still be applied as well and it should provide the effect you require.